Ten years ago, I got a call from a couple who wanted their engagement photos done in Central Park, NYC. I remember it being a beautiful fall day and I was so happy with how their photos came out. 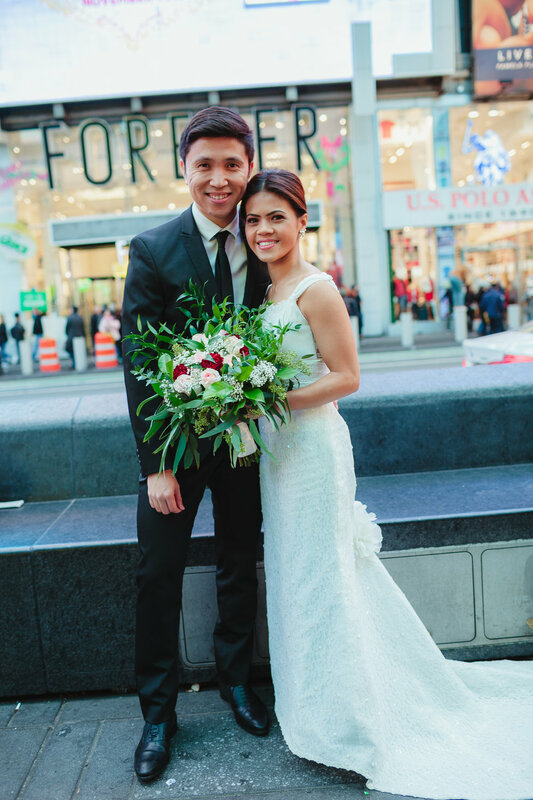 Fast forward November 2018, on their 10th year anniversary, they reached out once more wanting to re-do their wedding photos but this time, in the middle of Times Square, NYC. Back then, they told me, they had a friend take their wedding photos as they didn't have the budget for it. I was little hesitant at first as I don’t do weddings (even if this is not their actual wedding) and I know Times Square will be a zoo on a Saturday but I wanted to give them the opportunity to get professional pictures done wearing their wedding outfits. In the end, I was super happy with how their photos came out. They got dressed in their wedding best, bought flowers, bride had hair and make up done and to top it all off, even if Times Square was crowded, most folks were nice enough to get out of the way once they realized a wedding photoshoot was happening. Strangers congratulated them and even cheered when they kissed. The lights, the billboards, the crowds actually all brought about an interesting backdrop without distracting too much from the couple. It’s easily one of my favorite photoshoots, for sure because even if I’m not a wedding photographer, this is the closest I can get without the stress and pressure of photographing an actual wedding! I realized wedding photos can be re-done for whatever reason - a milestone anniversary, a vow renewal, if you’re not happy with how your photos came out, if your photographer disappeared and never gave you your photos or even if you think your wedding was too ‘trendy’ and want more classic photos to display. Any reason is perfectly valid, even if you just want to feel good again. It’s absolutely ok! Here’s a few of their engagement photos from 10 years ago. They were babies! Jennifer Miranda is a New York City and Northern New Jersey Professional Portrait Photographer specializing in babies, children and families. I am constantly working to raise the bar on my portrait services. If you have any questions or concerns about your past / upcoming portrait session, or simply want to provide feedback on my website, please let me know.